Great place next to a small beach a marina. The owners are very nice people! The aperment is located in the old town near the sea and the city center. Staying in this apartment was like a dream. The location of the apartment is superb: near to the port, a small cozy beach, pleasant bars and restaurants. The apartment has a private parking slot which is close to the flat. It is convenient because it is really hard to find a parking place at the village. The owners are friendly and helpful. 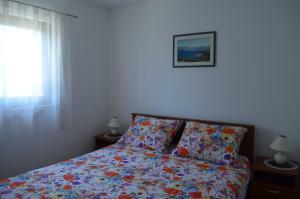 The apartment is well equipped, the bed is really comfortable and the view from the bedroom is very nice. Bra läge i den lugna änden av Baska men med gångavstånd till allt. Der Ausblick vom Schlafzimmer war traumhaft und die Lage ist auch perfekt. Sauber war auch alles - also top. Schon bei der Ankunft wurden wir sehr herzlich empfangen. Man hätte glauben können dass man schon viele Jahre befreundet ist. - Das Zimmer (bei der Ankunft mit der Klimaanlage schon vorgekühlt - es waren 30 Grad draußen) war sehr sauber und mit allen Annehmlichkeiten ausgestattet. Aus dem Schlafzimmerfenster kann man direkt aufs Meer schauen. -Hatte man einen Wunsch, wurde sofort alles in Bewegung gesetzt um ihn zu erfüllen. - Die Lage perfekt - direkt am Hafen - wo sich schon in unmittelbarer Nähe einige Restaurants und Bars befinden. - TOP! Jederzeit wieder!!! Lage im alten Ortskern, direkt am Hafen von Baska. Toller Blick direkt zwischen einem Olivenbaum hindurch auf den Hafen. Apartment direkt zwischen den Häusern von Einheimischen gelegen, welche sehr freundlich sind. Durch die Reise im Oktober sehr schön ruhig alles :) Temperaturen waren mit gut 20°-24°C sehr angenehm. Vor dem Hafen ist direkt ein kleiner Strand, an welchem man die Sonne geniessen und bei Bedarf sich im Meer abkühlen kann. 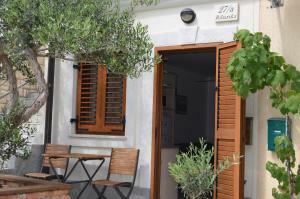 Lock in a great price for Apartments Lora – rated 9.6 by recent guests! Apartments Lora This rating is a reflection of how the property compares to the industry standard when it comes to price, facilities and services available. It's based on a self-evaluation by the property. Use this rating to help choose your stay! Apartments Lora offers accommodations in Baška. 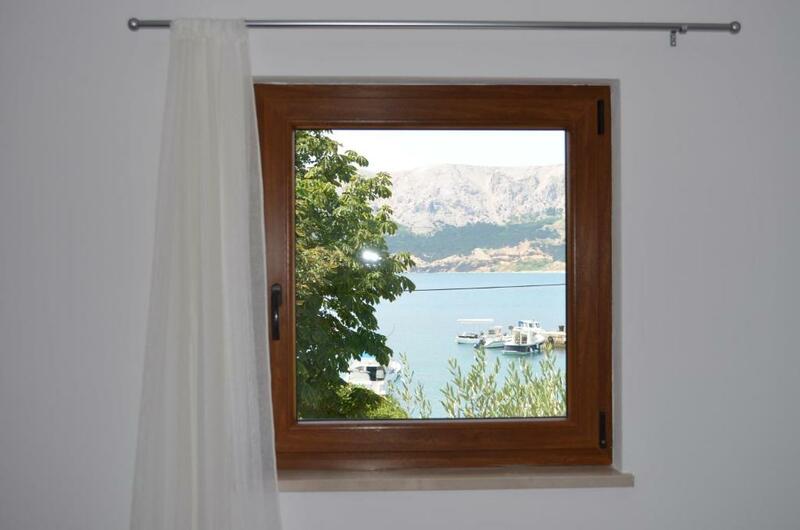 The property is 650 feet from Baška Port and free private parking is available. There is a small beach just 500 feet away, while the Vela Beach can be reached in 1,950 feet. The kitchen features a microwave and a refrigerator. A flat-screen TV with satellite channels is featured. There is a private bathroom with a shower. 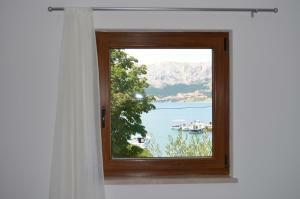 The apartment is located on the Baška Riva Promenade that features a harbor with boats. The first restaurant serving local cuisine is only 150 feet. The property offers free private parking wich is 800 feet away. 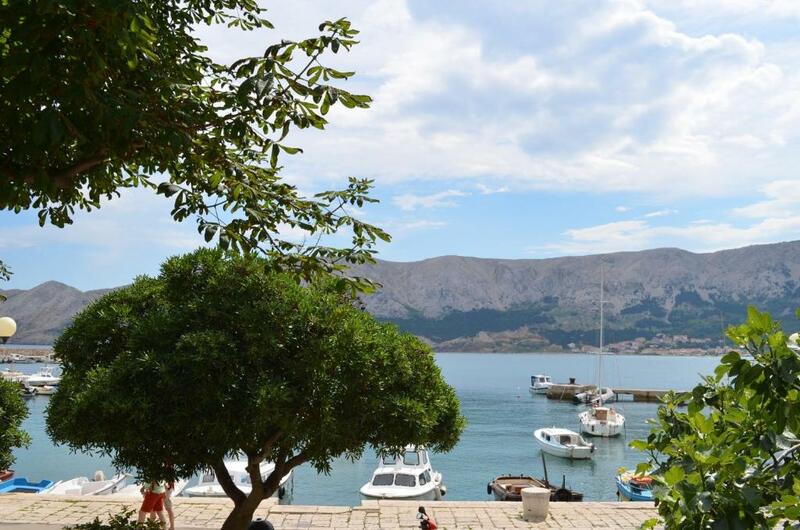 Baška Riva Promenade is 150 feet from Apartments Lora, while Baška Bus Station is 1,650 feet from the property. The nearest airport is Rijeka Airport on Krk Island, 25 mi from Apartments Lora. 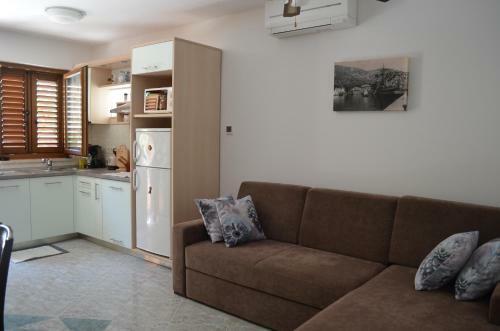 뀐 Located in the top-rated area in Baška, this property has an excellent location score of 9.8! When would you like to stay at Apartments Lora? Air-conditioned apartment offering a private patio with sea view, a flat-screen LCD TV and a fully equipped kitchen with a dining area. The private bathroom is equipped with shower. Please note that the room rate is based on 2 guests. Maximum occupancy is 4 guests, one sofa bed can be used as an extra bed (see Extra Bed Rates). This apartment features a stovetop, seating area and electric kettle. These apartments are located in a prime location in the center near the port where are the boats. They have a view of the sea, and the first small beach is only 100 meters away. Here you can enjoy close to all amenities, and the first restaurant serving local cuisine is 50 meters away. House Rules Apartments Lora takes special requests – add in the next step! Please inform Apartments Lora of your expected arrival time in advance. You can use the Special Requests box when booking, or contact the property directly using the contact details in your confirmation. 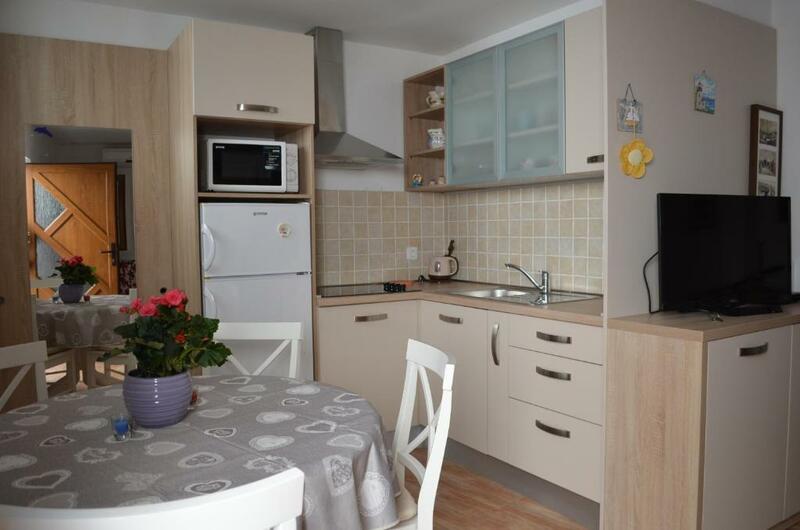 Very clean apartment, well suited for 2 adults. All kitchen amenities included (even dish soap, new sponge, hand soap in bathroom and dish towels, which usually aren't included) nice dishes and silverware, great cutting knifes, new pots/pans, large fridge. Comfortable bed and pillows. Nice bathroom and shower, always hot water. Location is very good, apartment just sets behind main walking area in front of sea/small harbor, so it is very quiet and peaceful. Nice view of sea (but the tree branches need to be cut to have a better view). Small table and chairs outside to have meals. Owners very friendly and helpful (she helped us with transporting luggage from car to apartment). They live on 3rd floor (2nd floor is another rental of theirs), so convenient to request things if needed. Free private parking for guests is nearby (this is a pedestrian area where limited cars can enter). Area to park bikes. 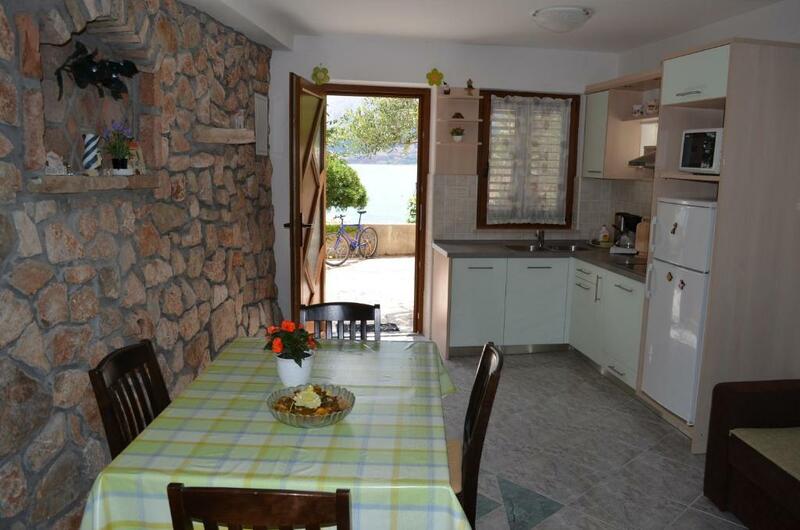 Excellent location to walk along harbor, sea, and the many restaurants and cafés. Can walk or ride bikes to Bunculuka Naturalist Beach/Camping. 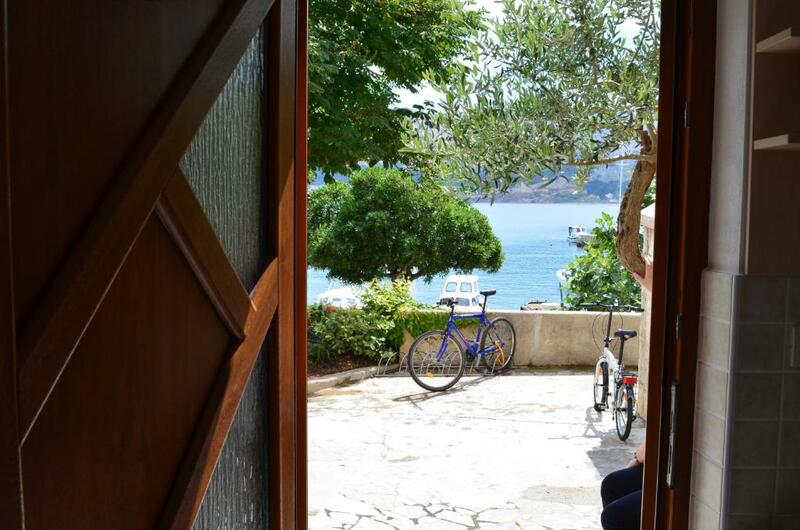 Coming back next year, we highly recommend this apartment and Baska! The appartment could have one more window in the kitchen, every time we came home it was bearely breathable.